The fourth annual Staff Art Show Reception Celebrate Staff! Celebrate Art! features the work of Sharon O'Neill, a Training Coordinator for the UVM Child Welfare Training Partnership in the Social Work Department. The Child Welfare Training Partnership offers learning opportunities for Vermont foster, adoptive and kin parents around the state in collaboration with the Vermont Department for Children and Families Family Services Division. This is the third year that O'Neill has contributed work to the Staff Art Show. 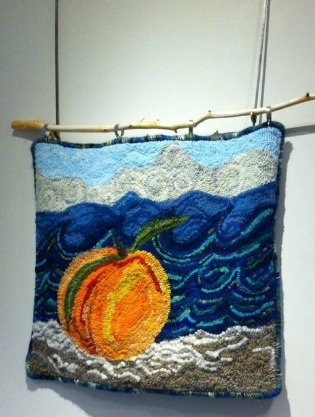 The rug hooking piece O'Neill shared this year features an original summer scene of a peach at the beach created with new and recycled wools and fabrics. The Staff Art Show, running from September 10th through the 30th, showcases the varied artistic talents of the UVM staff community and celebrates the Staff Council's 43rd year of service at the University of Vermont. The Staff Art Show is also part of the Staff Appreciation Week festivities for Fall 2014.